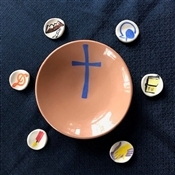 The Faith Formation Blessing Bowl set includes a single 4 inch beautifully hand-crafted ceramic bowl and 6 faith practice durable glazed pottery stones which can last a lifetime. The individually hand-crafted faith practice stones are about 1.5 inches in width and sized to fit in the blessing bowl*. The stones were chosen to represent the faith practices that are the most effective in developing, nurturing, and sustaining life-long faith formation. These essential faith practices articulate a foundational spirituality that shapes the lives of Christians. Faith is formed through relationships, and those relationships engage in fundamental Christian practices. These basic faith practices are evident in Scripture, church history, and modern research. It is through practices that faith becomes life-long and lived out from generation to generation. This set complements all Milestone Ministry Modules, Moments, and Taking Faith Home bulletin inserts. In addition to the four key faith practices of Caring Conversations, Devotions, Service, and Rituals and Traditions that are found at the heart of Milestones Ministry resources, we have added the joy of musical expression through music and singing and the personal bonding of sharing mountain high and valley low experiences. This faith formation blessing bowl set can be used by itself as a physical and beautiful guide to practice faith formation in the congregation and the home. It can also be used as a Milestones Ministry resource to be a tangible and useful guide to completing the faith practices found in each Milestone Module, Moment, and weekly Taking Faith Home bulletin insert when they are used. The ceramic bowl and stones are individually made, hand-painted, and glazed by Christian artist Dawn Deines-Christensen. *Note: Design in bowls may vary. All are symbols of Christian Faith. Purchase a faith formation blessing bowl set for every child baptized in your congregation. At the baptism, give the parents the set as a beautiful gift and practical reminder of the promises made to God for the child to learn the faith practices which result in life-long faith formation. If the congregation does not provide this type of baptismal gift, consider this set as a personal gift from the parents, grandparents, baptismal sponsors, or godparents of the newly baptized. Consider providing a faith formation bowl set along with a Milestones Ministry Moment for the home to each of your congregational families to strengthen family relationships and encourage its’ use to engage in faith formation in the home. At the beginning of confirmation training provide each confirmand’s family a set to use in the home as an intentional way for families to grow in their faith together during the confirmation period and after for life-long faith formation. Use with Taking Faith Home weekly bulletin inserts to easily conduct weekly Bible studies. Take the faith practice stones out of the bowl and place them back after completing each one as they are taken out of the Taking Faith Home outline. - Celebration of any Milestone Ministry child and youth, adult, or congregation milestone module. - Celebration of any Milestone Ministry Moment for the home. For congregations using Taking Faith Home bulletin inserts, the bowl set can be used alongside the bulletin insert in homes to extend the message throughout the week to encourage daily faith formation. Purchase as a meaningful and beautiful gift for friends and family members for Easter, Christmas, or other special occasions.